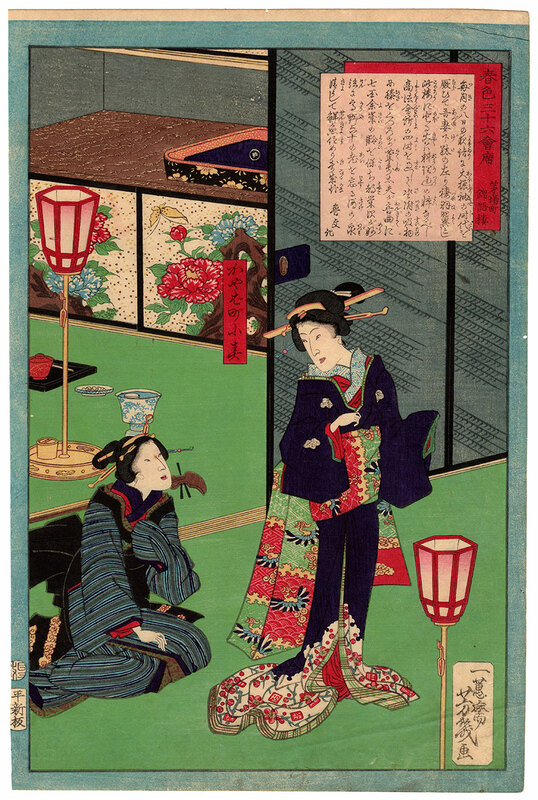 Elegant large oban (大判) format woodblock print made in March 1869 by the artist Utagawa Yoshiiku (歌川芳幾). The work, printed in collaboration with the publisher Hiranoya Shinzo (平野屋新蔵) owner of Aikindo (愛錦堂), is taken from the series "Colors of Spring at Thirty-six Restaurants" (春色三十六会席) and is titled "The Kingoro Restaurant in Kayabacho" (茅場町錦語楼). 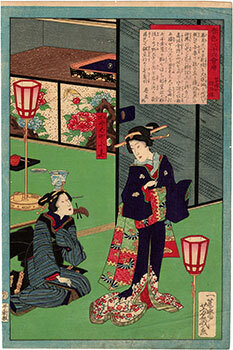 Utagawa Yoshiiku (1833 - 1904), also known as Ochiai Yoshiiku (落合芳幾), was a painter of the Utagawa school (歌川派). Son of the owner of a teahouse, Yoshiiku became in his youth a student of Utagawa Kuniyoshi (歌川国芳), imposing himself as one of the greatest exponents of his school. Appreciated above all as an illustrator of ukiyo-e (浮世絵) prints, in 1874 he was also co-founder of the newspaper Tokyo Nichi Nichi Shinbun (東京日々新聞). 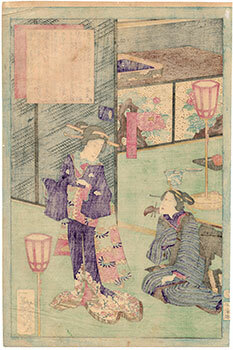 The work on Japanese washi paper (和紙), despite the right patina of the time and a bending mark on the lower right, is in good general condition.